Chivalrous culture formed in a feudal environment. The camp of the feudal lords was mixed. A few elite feudal class created the large landowners – media titles. These are the noblest, with the biggest pedigree of knights stood at the head of their troops, sometimes real armies. Knights below the rank served in these brigades with their troops, appearing on the first call to the owner. At the lower levels of knightly hierarchy was landless knights, all property which was held in military training and weapons. Many of them have traveled, joining the detachments of those or other commanders, becoming a mercenary and quite often hunted robbery. The military was the prerogative of the feudal lords, and they did everything to prevent participation in the battles “rude men”. Often prohibited the carrying of weapons and horse riding “Bazaar merchants, farmers, artisans, and officials.” There were times when the knights refused to take part in the battles together with the commoners, and in General with the infantry. According to the distribution in the knight environment of ideas, a true knight had to come from a noble family. Self-respecting knight referred to for confirmation of his noble origin in branching genealogical tree, had a family coat of arms and family motto. Belonging to become inherited, in rare cases, the knights were dedicated to special military exploits. The harshness of the rule was violated with the development of cities these privileges were more often sold. In different countries there existed a similar system of education of the knights. The boy was taught horseback riding, possession of weapons, primarily the sword and lance, as well as wrestling and swimming. He became a page, then a squire when knight. Only after the young man was honored to go through the rite of initiation into the knights. The knighting (1322-1326). Simone Martini. There was also a special literature devoted to the knight’s “art”. The future knight was taught, among other things, and hunting techniques. Hunting was considered the second after the war, occupation, worthy of a knight. The knights developed a special type of psychology. The perfect knight was obliged to have numerous advantages. It needs to be externally beautiful and attractive. Therefore, special attention was paid to clothes, decoration, figure. The armor and horse trappings, especially the front, were the real works of art. The knight required physical strength, otherwise, he just wouldn’t be able to wear armor, which weighed up to 60-80 kg. Armor start to lose their role only with the invention of firearms. The knight expected that he will continuously take care of its glory. His valor had all the time to confirm, and many knights were in constant search of new opportunities. “If there is a war, I’m here to stay”, said the knight in one of the ballads of the poetess Marie de France. Nothing out of the ordinary to compete against unfamiliar opponents, that if something caused discontent. Organized special tournaments. In article 11-13 developed the rules of chivalry duels. So, the participants had to use the same weapons. Most first rivals raced one another with a spear at the ready. If the spears broke, took up swords, and then for Mace. Tournament weapon was blunt, and knights trying only to knock the opponent out of the saddle. For the tournament after many individual duels that could last a few days arranged the main competition – imitation battle between two teams. Jousting became part of the battle in the endless feudal wars. This match took place before the battle, the duel ended with the death of one of the knights. If the fight was conducted, it was believed that the fight started “by the rules”. Among the knights was developed solidarity. History is replete with examples of true knightly behavior. During the war between the Franks and Saracens, one of the best knights of Charlemagne named Ogier took the fight to the knight of the Saracens. When Ogier cunning captured, his opponent is not endorsing these techniques, he surrendered to the Franks, so that they could change it to Ogier. 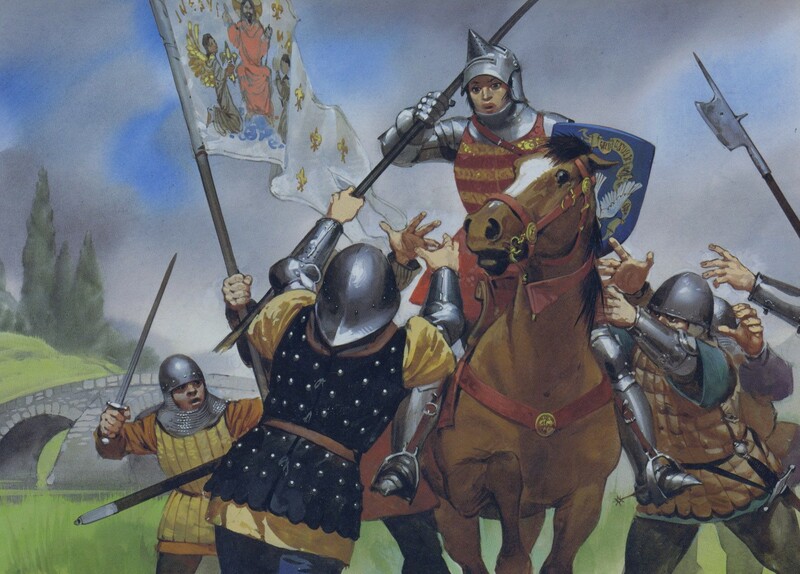 During one of the battles during the Crusades, Richard the Lionheart found himself without a horse. His rival sent him two war horses. In the same year, Richard has devoted his opponent in the knights. The highest expression of chivalrous love of war, the aggressive desire of the feudal lords for the conquest of new territories, supported by the Catholic Church began the Crusades to the East under the guise of protecting Christians and Christian Holy places from the Muslims. In 1096 was the first of them, and in 1270, the last. During their carrying out have special military-religious organizations – knight orders. In 1113, founded the order of St. John. In Jerusalem, near the temple was the center of the knights Templar or Templar. Managed the order of the Grandmaster, obey personally to the Pope. Entering into the order, the knights swear an oath of obedience and humility. They wore the monastic cloaks over the knight’s armor. Of aggression against the Slavic peoples, the main role was played by the Teutonic order.